It’s Friday! Which means this week is finally over. And it means it’s Valentine’s Day! So, whether you need something to celebrate making it through a rough week or a special dessert to celebrate with your loved one, I have an easy recipe that is sure to brighten any day! 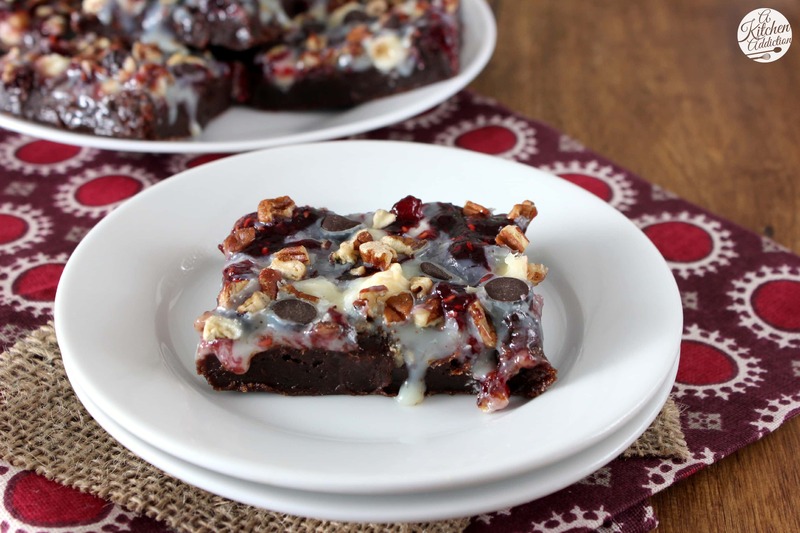 These raspberry brownie magic bars are guaranteed to put a smile on your face! The base is a rich, fudgy brownie that would be amazing all by itself. In fact, it’s one of my go-to recipes when I want to whip up a quick batch. Instead, I topped it with raspberry preserves, 3 kinds of chocolate, and toasted pecans. Sweetened condensed milk is then poured over top. Can you go wrong with adding sweetened condensed milk?! It just adds another rich, gooey layer to these already rich, decadent brownies. Yes, they really are irresistible! Preheat oven to 350. Line a 9x13 inch baking dish with aluminum foil and spray non-stick cooking spray. In a large saucepan, melt butter over medium heat. Stir in sugar until sugar starts to dissolve. Remove pan from heat. Whisk in eggs one at a time. Stir in vanilla. Mix in baking cocoa and stir until well-blended. Add baking powder, salt, and flour. Stir until well-combined. Pour batter into prepared baking dish. Bake for 10 minutes. Remove from oven and sprinkle with semi-sweet chocolate chips and white chocolate chips. Pour sweetened condensed milk over the top. Drop preserves over the top and gently swirl through condensed milk with a knife. 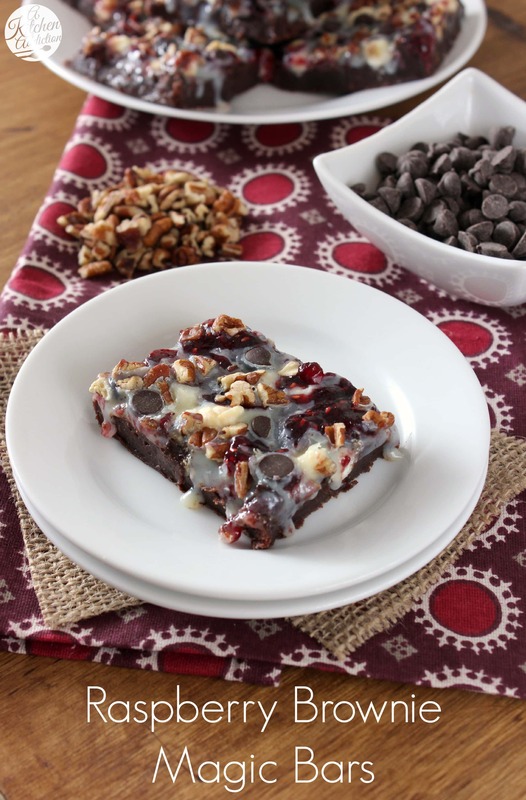 Sprinkle chopped pecans and dark chocolate chips over the top. Bake for an additional 15-20 minutes or until edges start to turn light brown and center is set. What a great magic bar. Happy Valentine’s Day! Chewy, oozy goodness. These are definitely the best way to spread the love! Wow! I could use one of these. I has been a stressful week. Happy Valentine’s Day! Thanks Jennie! Hope you get to relax! A perfect dessert to celebrate you or the one you love! The gooey topping would make me melt. These look so fabulous. I love everything that is going on in these brownies! I have never made magic bars before. I really like that name 🙂 These look really fudgy and super luxurious. Great looking brownie bars! Decadent indeed! Just the way I like it! looks divine! can’t wait to try, pinned! These look amazing! I love how you topped the bars with ooey gooey condensed milk! I punk puffy heart magic bars. These are amazing! YOu will have to physically remove me from this pan because I wouldn’t be able to pull myself away!! Gorgeous! Holy cow, those look crazy good! 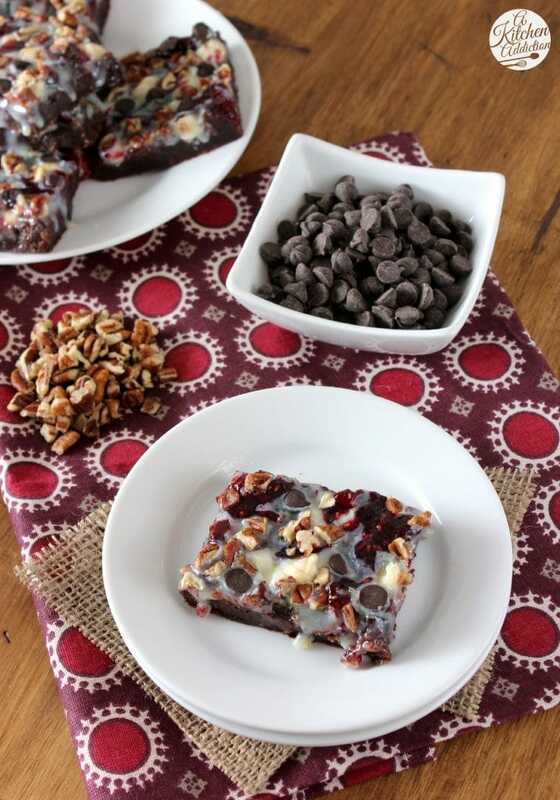 These magic bars have such a creative spin to them with the raspberry and brownies. Love!